They are reddish brown in colour with a pale coloured underside. Their long, bushy tail has a distinctive black tip and they have a long, pointed muzzle. Bengal Foxes live in grasslands, wooded areas and semi-arid regions of India, Nepal and Pakistan. They live in pairs and they inhabit burrows that are 0.6 - 0.9 m (2 - 3 ft) below the surface of the ground. Bengal Foxes are omnivores and they mainly feed on birds, rodents, reptiles, insects, eggs and fruit. Although they live in pairs they usually hunt alone. Bengal Foxes breed once per year and mating takes place from December to January. After a gestation period of 51 - 53 days, 3 - 6 young are born in a den. Both parents help to raise the young and they are weaned at around 1 month old. The young foxes become independent at 4 - 5 months old and they reach sexual maturity at 1 - 2 years of age. Humans, wolves and feral dogs are predators of the Bengal Fox. 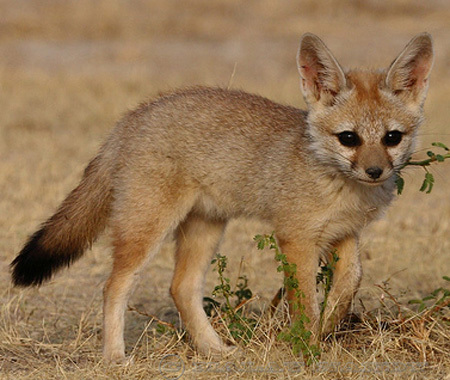 There are no subspecies of the Bengal Fox.